You know what makes a real talented coach? A group of talented hockey players! In saying that, having the most talent doesn’t guarantee success either, as Mike Babcock pointed out prior to the 2010 Winter Olympics in Vancouver. So what is the factor that turns a group of talented individuals into a harmonized unit capable of winning in big moments? Chris DiPiero is the Director of Athletics at St. Michael’s College School in Toronto. St. Mike’s is one of the more renowned developers of hockey talent in Canada’s hockey history, boasting an alumni list that includes the likes of Gerry Cheevers, Dave Keon, Tim Horton and Frank Mahovlich. Chris has also had the experience of guiding the St Michaels Buzzers (OPJHL) for seven seasons and was the head coach and GM of the Oshawa Generals (OHL) for four plus seasons. Following his stint in the OHL he was hired as an amateur scout for the Pittsburgh Penguins. He’s done his share of scouting and recruiting at various levels, and was a perfect fit to speak on the process of not only recruiting talent, but also identifying the talent that fits best with your program. He references former Flyers head coach Fred Shero as saying “…. there’s always a BUT..” when it comes to identifying players. What that means is that once you’ve determined if a player can skate, pass and shoot, the “BUT” refers to how the player fits into your coaching philosophy and team identity. Before you set out on the recruiting trail, Chris recommends answering the following questions first to better understand the type of players that will find success in your program and in turn, help your program achieve success. What do we stand for? What do we value? What type of player(s) do we want in our system? Who do we want to represent our organization? What you might find is that the best fit for your program isn’t always the most skilled player. Ideally we could all fill our roster with players who combine elite skill coupled with elite character. But for most of us, building your team is a process of fitting together pieces that are greater than the sum of their parts. And this applies to minor hockey too. You have to know where you’re going before you invite people on the bus. Chris spoke on his philosophy when it comes to Talent Identification at our inaugural TeamSnap Hockey Coaches Conference in Toronto this past summer. Below is an excerpt from his presentation. 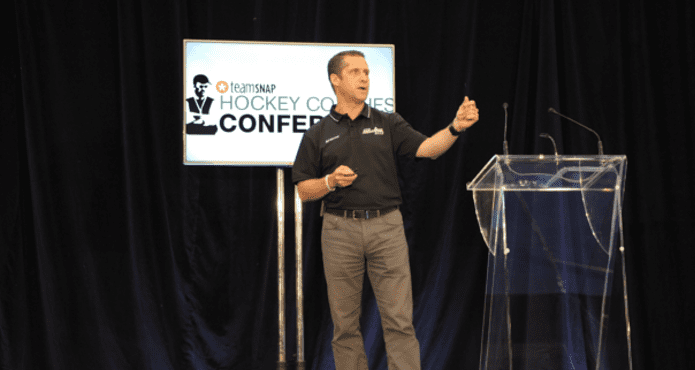 Of course, if you enjoy what you hear, consider signing up for a FREE 30 day trial on our TCS | MEMBERS site for access to our entire library of videos from our annual TeamSnap Hockey Coaches Conference.